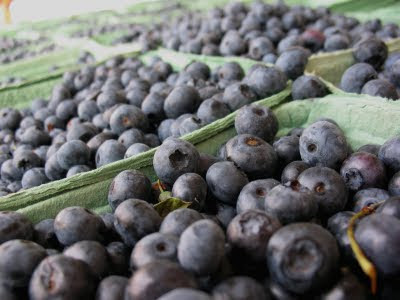 With a bumper crop of blueberries in Richmond this season, it's been easy to get them for a fairly decent price. Usually I don't buy a flat of blueberries, but this year I couldn't resist. Without enough space in my fridge to just keep adding blueberries, I did what any other canning woman would do-I made jam! 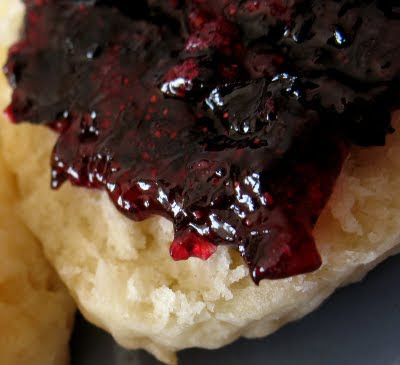 I'd forgotten how delicious blueberry jam is. This recipe is straight out of the box of Liquid Certo and yes, it has a lot of sugar. If you would prefer one that is lighter, I did find this recipe on Canadian Living's website. It uses Certo Light instead and 1/3 of the sugar of my recipe. I haven't tried it though so I don't know how it tastes. Measure the blueberries, lemon juice, and sugar into a large pot. Over medium heat, stir and bring to a boil. Boil the mixture hard for a full minute, then remove from the heat and stir in both packets of Liquid Certo. Continue to stir for 5 minutes, while the jam cools. Ladle into hot sterilized jars, wipe the rims, and top with prepared Snap Lids, then rings until finger tip tight. Process in a boiling water canner for 5 minutes. Makes about 5 jars (four 500 ml and one 250 ml).